Colfax's Ninja Developer Platform Pedestal is a pricey desktop rocking Intel's Knights Landing chip, which is primarily designed for supercomputers. Colfax’s new Ninja desktops are anything but invisible; these workstations can roar with the unprecedented computing power of Intel’s latest 72-core supercomputing chips. Knights Landing wasn’t designed with desktops in mind, but for some of the fastest supercomputers in the world. The 72-core chip can be used as a primary CPU, or as a coprocessor to rev up intense computing tasks, much like GPUs. The expensive Ninja workstations can be ordered from Colfax’s website, and will ship at a later date. A pure desktop-style tower box called “Ninja Developer Platform Pedestal” starts at $4,983. A base configuration includes a 240GB SATA SSD, a 4TB hard drive, and 96GB of DDR4 memory. The price jets up to $7,577 for a fully loaded configuration with two 1.6TB SSDs and two 6TB hard drives. The liquid-cooled system includes multiple PCI-Express 3.0 slots and two gigabit ethernet ports. The desktops will have CentOS 7.2 Linux. It’s unclear whether these workstations will support Windows, but Intel hasn’t yet recommended the OS for the 72-core chip. Workstations are powerful desktops used for graphics, film editing, virtual reality and engineering applications. 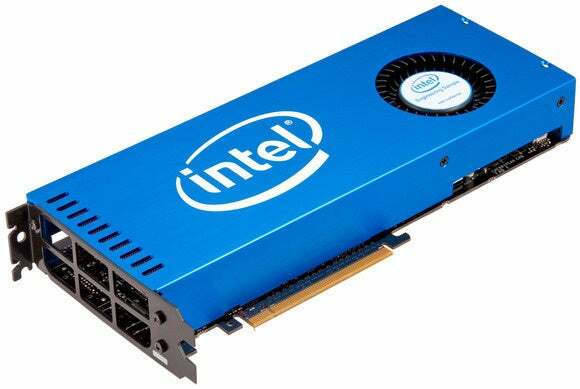 Recently introduced workstations from Dell, HP and Lenovo come with Intel’s new Xeon E5-2600 v4 chips, which have up to 22 cores. The pricey Ninja desktops aren’t for fun and games. The workstations are for researchers who want to write and test applications before deployment on supercomputers with Knights Landing. Desktops with CPUs and GPUs still remain a safer option for as conventional applications and games aren’t tuned to extract the full computing power of the 72-core chip. The Knights Landing chip is tightly integrated into the system, making it tough to add more memory and components. It’s not known if GPUs from Nvidia and AMD will work with Knights Landing, but if they are able to coexist, the desktops could deliver amazing performance. Knights Landing can deliver about 3 teraflops of peak performance, which is about the same as some high-performance GPUs in the world’s fastest supercomputers today. The chip mixes conventional x86 CPUs with specialized vector processing units, differentiating it from regular x86 chips in PCs and servers. Knights Landing will be used in supercomputers like Cori, which will go live later this year at the National Energy Research Scientific Computing Center in Berkeley, California. An earlier Xeon Phi chip is already in China’s Tianhe-2, which right now is the world’s fastest computer, with peak performance of 54.9 petaflops.